It was supposed to be sunny, and it was for the first hour, then party cloudy with hazy sun. But it was much better than the "standard" hiking weather we've had for the past couple of months, so I guess we should be happy to get it! Anyway, 12 Wednesday Group hikers drove down to the area of the Hiwassee River and hiked the four-mile trail from Quinn springs Campground to Oswald Dome. Though the trail climbs a total of about 2200 feet, it is well graded and well maintained. The scenery is good, with most of the trail surrounded by mature forest. The apex of the "Dome" was a bit disappointing for those of us who had not been before, as it was populated by several small building and communication towers, without a good view, or even a pretty place to sit down and have lunch. On the way back some guy with a gps suggested we try out a side trail that leads to Lowry Top, but it was also disappointing, so we turned back and went off trail back to the the trail we came in on. 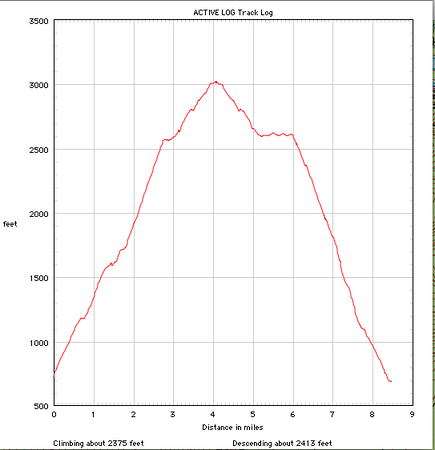 Our elevation profile. Total gain 2375 feet.